(Please note, this product was formerly known as "Super GLA" oil softgels. 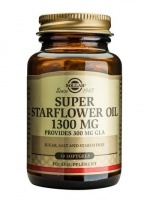 The ingredient "Borage" is changed to "Starflower", which is another name for the same thing. The name change is purely for marketing purposes - neither the product nor its ingredients have changed.) Cold-pressed, hexane free borage oil. As a food supplement for adults, one (1) softgel capsule daily, preferably at mealtime, or as directed by a healthcare practitioner.